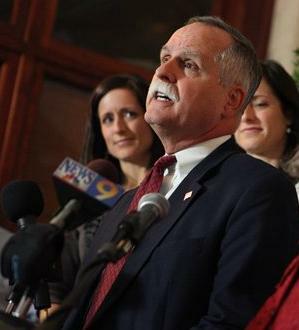 Did Rep. McKinley understand his own amendment? February 24, 2011 by Ken Ward Jr. Yesterday, I was re-reading the House floor debate over the coal industry riders pushed through by the Republican leadership (with a little help from our good friend, Democratic Rep. Nick J. Rahall). These actions by the EPA continue to justify why so many Americans worry about the EPA’s relentless war on coal. If the EPA can be allowed to retroactively revoke a permit in West Virginia, they can continue this onslaught wherever water permits exist throughout America. Any entity discharging water is vulnerable to having their permits pulled and will put at risk city sewage treatment plans, farms, mines, steel mills, and chemical plants. OK … here’s the thing. EPA vetoed a Section 404 permit — known as a “dredge-and-fill permit” for the Spruce Mine, not a water discharge permit of the type McKinley is worried about regarding steel mills and city sewage treatment facilities. Those are permits issued under a separate part of the Clean Water Act, Section 402. … The use of funds used by the Administrator of the EPA to carry out section 404(c) of the Federal Water Pollution Control Act. So if Rep. McKinley is concerned about those city wastewater treatment plants and steel mills, he’s going to have to rewrite his amendment. Spot on analysis Ken! I just love the language that politicians use, like the “relentless war on coal”. The EPA vetoes ONE of literally hundreds (and yes I have a mere 2 dozen on my desktop alone) of Section 404 surface mining permits destroying anywhere from 300 to 45,000 feet of streams and they call it a “relentless war”. Meanwhile in the real world the relentless war on the environment, which if you only want to include modern mining equipment, has been going on for decades and continues relatively unchecked. If anyone can claim and prove that the water or living conditions in Kentucky are getting any better anywhere then I will eat my hat. Once again we are being told to obey or enforce the law but only when business interests deem it OK. Way to go Congress! But he’s a first-timer in Washington, so maybe his error is understandable? Ken, you still don’t get it, do you? If EPA can “get away with” vetoing a 404 permit, then they will be emboldened to start vetoing other permits, like sewage plant permits. Then, when other government agencies see EPA “getting away with” vetoing sewage plant permits, those agencies will start vetoing other authorizations — like benefits for disabled people, highway construction approval, etc. So, Ken — if you just look at the situation logically, Western civilization itself is at risk due to EPA’s high-handedness! Why bother understanding the difference between 404 and 402 when you can let the coal industry write your legislative agenda for you…..
Just wondering, wouldn’t defunding the EPA remove their ability to review and approve permits? Just several years ago, Nick Joe Rahall was saying OSM need to be OSMRE and that he was going to get the Reclamation and Enforcement back into that federal agency. This confluence of news reinforces what’s long been plain: Kentuckians cannot count on their state government to protect the environment or the public interest from the coal industry. Until the state’s political culture changes, any hope for justice will have to come from the federal government, the courts and, yes, the active participation of citizens. I have to say I think you are being a bit of a nit-picker on this one. Yes….technically, it is a Section 404 permit that was pulled, not a water permit but I believe from reading the statement that what the congressman was trying to say is that the EPA added a discharge water restriction to the 404 permit requirements that was not part of the requirement when the permit was filed and originally approved by the Corp. From there, it is not hard to understand how other industries can worry about permits getting pulled or refused because of a water quality restriction that was not in place when they filed the permit application. I believe it to be a valid point. And to Vernon’s point, you must remember that the EPA does not have to approve the permit for it be a valid permit. The Corp has the responsibility for that. We all know the EPA has the right to review the 404 permits but my understanding of the law is that they don’t approve them. In most states, like here in Pennsylvania, the thing that the EPA revoked sounds like what is is called a “401 Water Quality Certification” and is issuedby the state DEP as a condition to the Corps of Engineer’s issuing the 404 stream filling permit. I apoligise for what may be “newbe” questions, but can someone clarify what exactly the EPA “revoked” with regard to the Spruce Mine? What is the West Virginia DEP’s role in this. I assume that they issued a 401, correct? http://blogs.wvgazette.com/coaltattoo/2011/01/13/breaking-news-epa-vetoes-spruce-mine-permit/ and not the 401 certification you’re talking about. WVDEP here does not have its own 404 program, though they would allowed under the CWA to start one if that’s what they wanted to do. mark – what I hear you saying (and what I am hearing from mtr supporters) is that surface mining jobs are more important than the environment we all live in today and also what all our children and future generations will live in as well. An understandable perspective from YOU, when that is how you make your living and feed your kids, but sometimes we have to make the hard decision and choose what is right for everyone’s future. A bad idea is a bad idea, the fact that a certain percentage of the population makes a living off of it does not make it right. I’m all for discussion and give and take – I realize all mtr mining is not going to end overnight. It WILL end eventually – the question is will there be anything left to live in and raise a family when it does? I would ask a question to you and all mtr workers – do you have any plans or thoughts as to an alternative income source or is it mtr or nothing, regardless of the cost? You mean the 401 program, right? The Corps of Engineers administers the 404 program. WV must issue 401 water quality permits for any application of a Cprps of Engineers 404 permit, (or a “Section 10” permit if it is a waterway used for navigation. With regard to coal mining sites, I suspect it is almost always just a rubber stamping process. However, as a former Corps of Engineers employee who used to review (and for our own projects, prepare) 404 permit applications, I don’t recall any states in the Pittsburgh, Baltimore, Huntington or Louisville Districts that do this. The states issue a 401 certification, for which the Corp’s 404 permit was contingent. I used to encourage activists to expend their limited resources on the state 401 certification process, not our 404 permit process, since at the Corps, our specialty was hydrologic impacts (mostly flood risks) of filling or altering a stream. Most of the time, there are no concerns (although we did do a hydrologic study of two representative watersheds at the Hobet 21 and Samples mines). So our role was largely administrative. So, the more important concerns to most people are the state 401 certification which addressed the water quality impacts of filling, altering, or dredging a stream or river. I’m not aware of any states in this region that run their own 404 programs. It is an option, though. My guess is the reason citizen groups go after Corps 404 permits is that doing so allows them to get into federal court, rather than state court. Federal judges don’t have to run for election and are thus less likely to be influenced by the political impacts of their decisions. Ken is correct with regards to why citizen’s groups – in WV at least – take the Corps of Engineers to court over 404 permits. How far does any realistic, rational person think such a complaint would get in a WV district court? Or in front of the Environmental Quality Board? Or any other board that is, supposedly, there to look out for the average citizen’s interests? It’s not going to happen. When you only have limited resources, you have to expend them where they have a chance of doing some good. Or, in this case, where they have a chance of at least being heard. Which in WV, for anything having to do with environmental protection, means a federal court.